INDIANAPOLIS — Teniya Page set a Penn State Big Ten Tournament record with a career-high 38 points and the Nittany Lions cruised to an 83-57 win over Illinois in a first-round game on Wednesday. Page, who scored 35 points in the tournament last year to tie the record, was 14 of 24 from the field, including 4 of 8 from 3-point range, and 6 of 9 from the foul line. She also had four rebounds, four assists and two steals. The 38 points is second in tournament history behind the 43 Ohio State’s Kelsey Mitchell had against Rutgers two years ago. 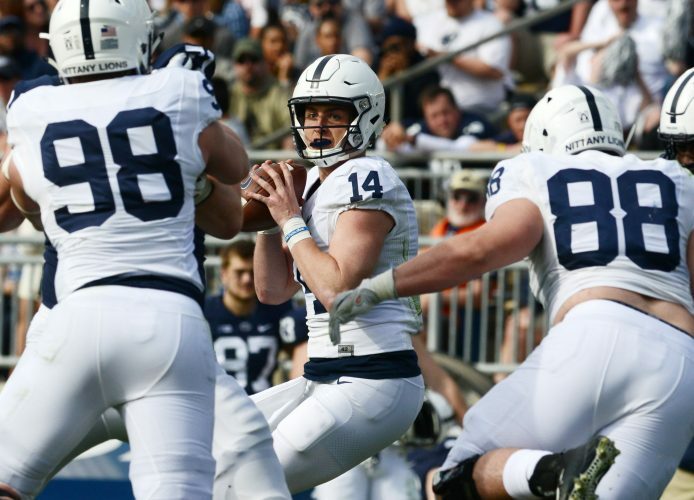 The 11th-seeded Nittany Lions (16-14) advanced to face No. 6 seed Michigan tonight. Page scored 13 straight points in a 15-0 run and 18 points overall in the second quarter when the Nittany Lions erased a seven-point deficit to take a 33-27 halftime lead. She also had 15 points in the third quarter as Penn State got the lead into double figures for good. Alex Wittinger and Brandi Beasley had 21 points apiece for the Illini (9-22), who have lost 18 straight. Wittinger, who had the first triple-double by a Penn State opponent in the regular-season meeting, also had 10 rebounds. ILLINOIS (9-22): Wittinger 9-16 3-4 21, Beasley 8-18 2-4 21, Cattenhead 1-2 2-2 4, Holesinska 2-6 0-0 6, Rice 0-2 2-2 2, Andrews 0-1 0-0 0, Ball 0-0 0-0 0, Kinslow 0-1 0-0 0, Robins 1-2 0-0 2, Walker 0-0 1-2 1, Joens 0-3 0-0 0, Kirkpatrick 0-6 0-0 0, Moore 0-2 0-0 0, Totals 21-59 10-14 57. PENN ST. (16-14): Boykin 1-2 0-2 2, Smith 4-6 3-4 11, Carter 4-11 1-2 10, Page 14-24 6-9 38, Travascio-Green 1-8 1-2 3, Breen 1-1 0-0 3, Williams 3-5 1-3 7, Frazier 2-3 0-0 4, Knizner 0-1 0-0 0, McDaniel 2-4 0-0 5, McMurtry 0-0 0-0 0, Semion 0-0 0-0 0, Totals 32-65 12-22 83. 3-Point Goals–Illinois 5-16 (Beasley 3-6, Holesinska 2-3, Rice 0-1, Andrews 0-1, Kinslow 0-1, Joens 0-2, Kirkpatrick 0-2), Penn St. 7-23 (Carter 1-4, Page 4-8, Travascio-Green 0-5, Breen 1-1, Frazier 0-1, Knizner 0-1, McDaniel 1-3). Assists–Illinois 10 (Beasley 5), Penn St. 17 (Boykin 4). Fouled Out–None. Rebounds–Illinois 37 (Wittinger 11), Penn St. 41 (Carter 7). Total Fouls–Illinois 17, Penn St. 15. Technical Fouls–None. A–3,119.